The Vimy project has been created to inspire the pioneers of tomorrow by providing a vivid reminder that only the brave and imaginative being about progress  never the critics and skeptics! Our not-for-profit organization has a dedicated team of volunteers to not only keep this magnificent machine in the air, but to give lectures and slide shows to thousands around the world. Without financial support from many individuals and corporations, this "galleon of the skies" would still be trapped in the dusty drawers of history. We hope you'll help us continue this remarkable and historic spirit of adventure and exploration across the Atlantic and on to a lead role in the 100th anniversary of flight celebrations in 2003. On these pages you can learn more about the Vickers Vimy, including its history and how it was built. 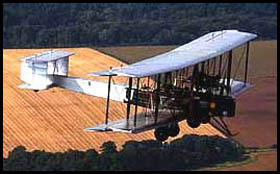 You can also find many photographs of the plane, taken by Vimy Aircraft Project volunteers and supporters. Our successful 1994 15,000 mile adventure from England to Australia resulted in the cover story for the May 1995 issue of National Geographic and the National Geographic TV documentary, "The Greatest Flight." Her 1999 "Silver Queen" voyage spanning 9,000 miles from London to Cape Town was also featured in National Geographic, in May 2000. The third and perhaps most important heroic flight, the Transatlantic flight, is scheduled for 2002.